I can’t say no to you even though I tried. It was not for your sake or anyone else’s or to appear sane, so all I ask of you is to never let me down. After the walk in the Gaslamp, where I saw the new Borders building under construction, I can see you there on opening day when you cut the ribbon and you, as the celebrity, officially open the store. I wonder if you’ve ever been to the Gaslamp District? Probably not, because that’s where all the pornos and the hookers use to be, and you’re too classy for that. It’s very clean and beautiful now. I can imagine you in your Gold Mercedes driving down 5th Avenue. Unfortunately, there isn’t a Prada or a Chanel boutique so Nordstrom’s, the couture section, may be the only place you can go to shop. But you don’t have to go there. You can mix and match and you do that better than your friend Sarah Jessica Parker. 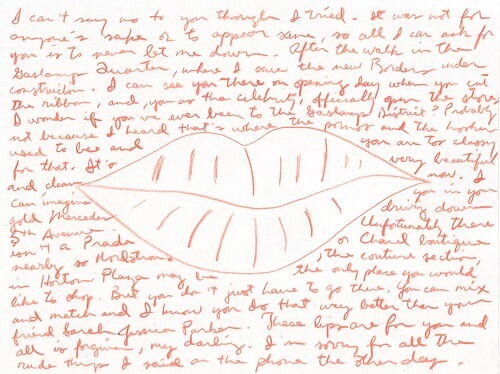 These lips are for you and all is forgiven, my darling. I’m sorry for all the rude things I’ve said on the phone the other day.